Javalambre, Teruel, Spain. 2020 meters above sea level, 0.85" median seeing. Hello, We are Vicent Peris and José Luis Lamadrid. 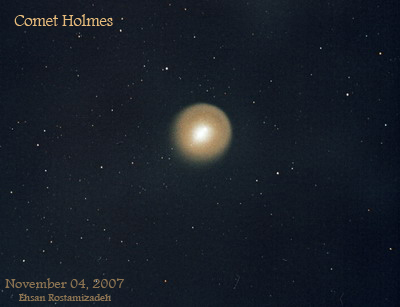 We have taken a photo of the comet Holmes, on the night of 1st - 2nd November. 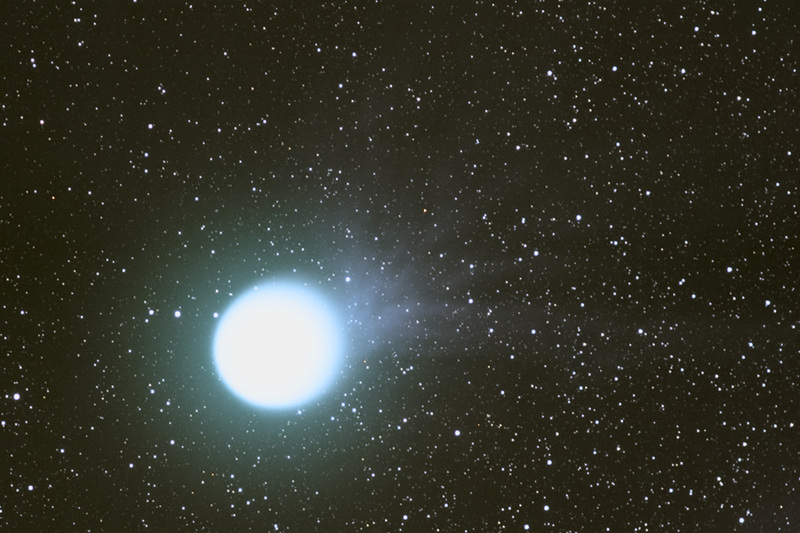 It's a DSLR photo (Canon 350D), taken with a Takahashi astrograph (18 cm. f/2.8). It's a combination of 4x10', 26x1' and 30x15" exposures. All the processing have been made in PixInsight. 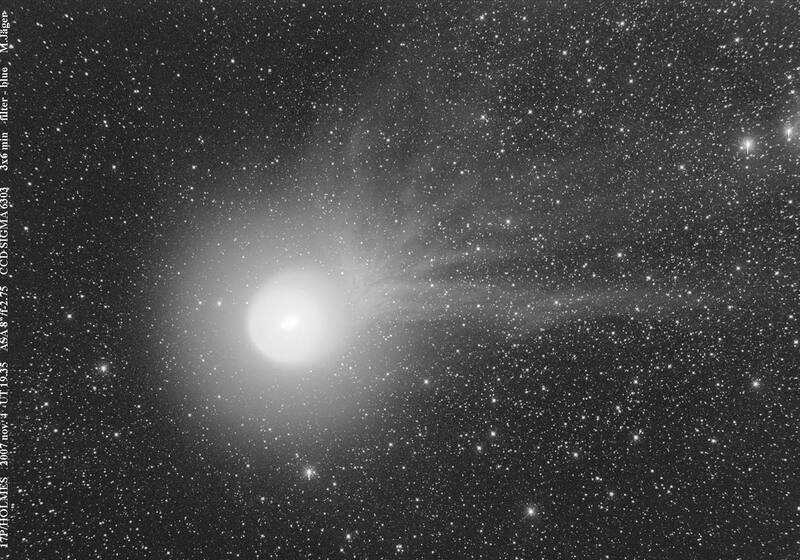 We are very happy with the overall result, specially with the "bubble effect" of the inner and outer comas of the comet, as well as with the tail structures and inner jets. Here is the link to the full resolution image and with 800 pixels wide. 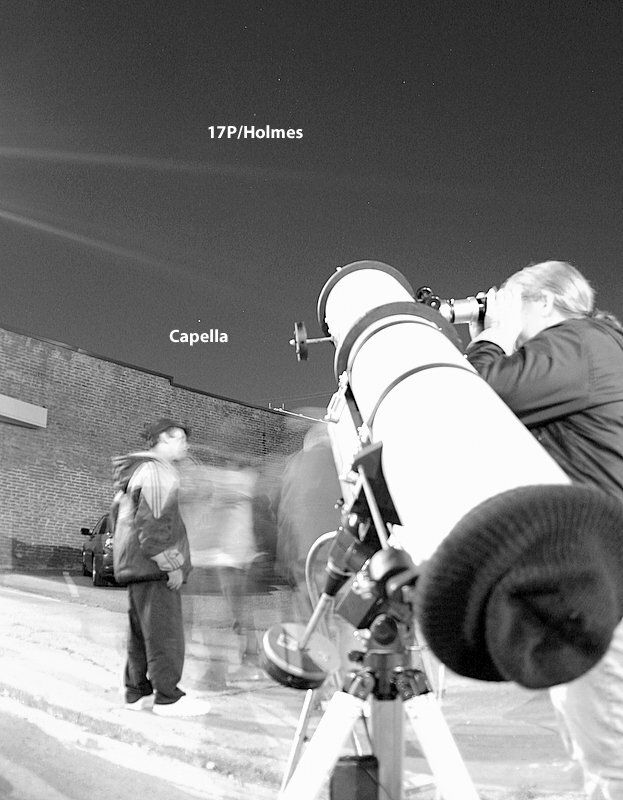 Dozens of people stopped during their visits to all the art galleries to have a look at Comet Holmes Fri. night in downtown Kansas City, Missouri. Many were able to pick it out of the urban sky with their naked eyes! Canon Rebel XTi with a 16mm Nikkor fisheye lens @ f/2.8, 1 second exposure at ISO 400. Had a clear evening after remnants of Hurricane Noel brushed eastern seaboard. 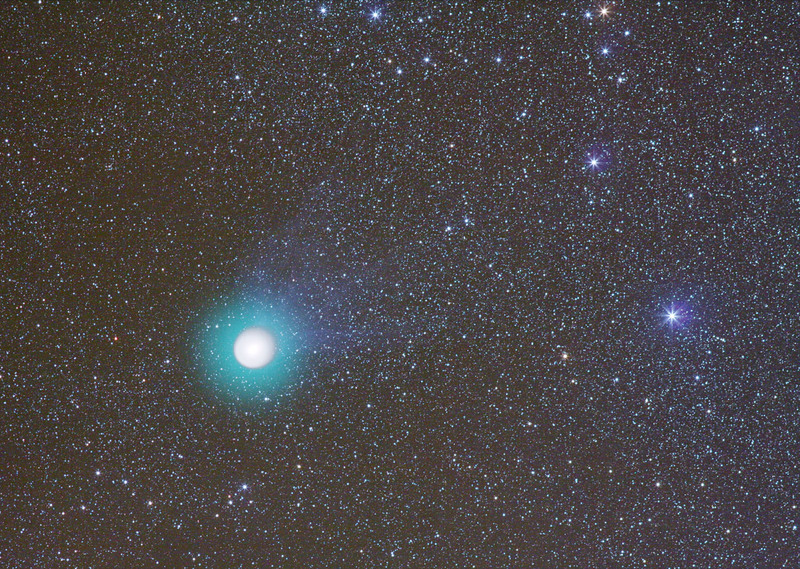 Comet was high in the sky approaching meridian, shows part of fan tail. Taken through Baader filter modified Canon Digital RebelXT, Canon 200mm @ f/3.2. 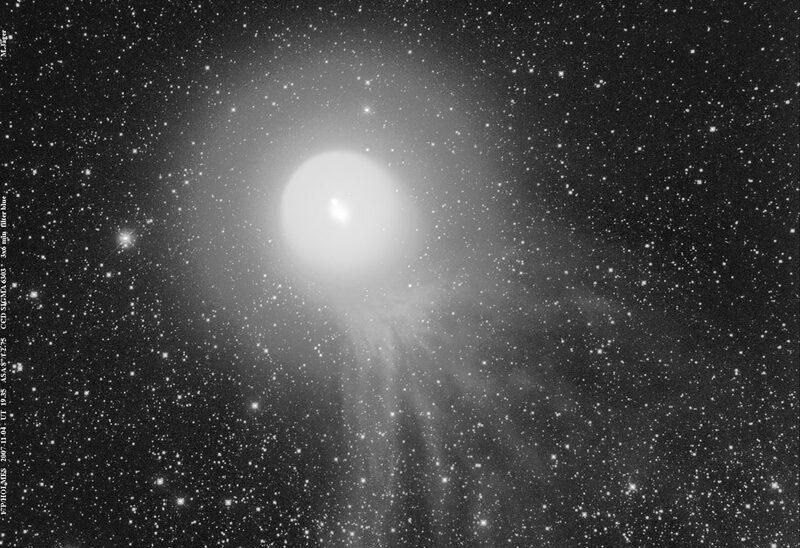 Composite of 69 x 45sec images at ISO 800 through IDAS filter, driven by Kenko SkyMemo mount. The comet was easily seen with naked eyes and a great view in a binocular. 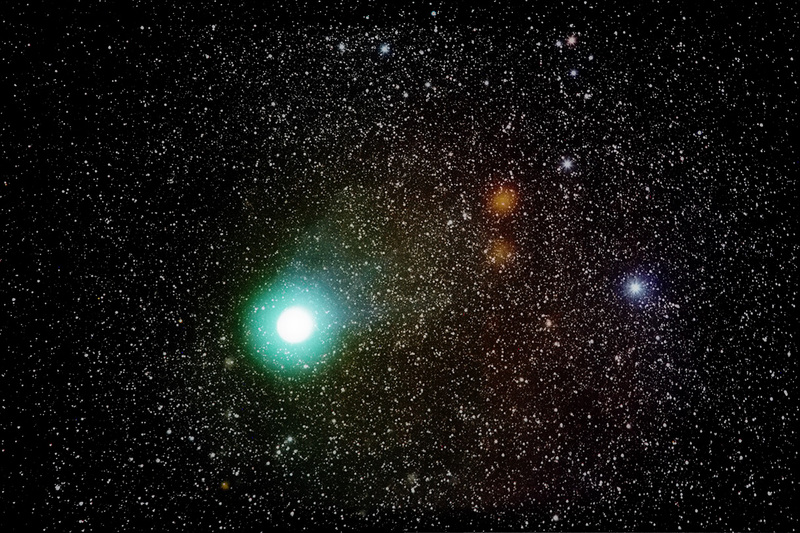 The background image is a composite of two pictures taken with a Canon 300D, 1600 ASA, F4 2 min guided exposures using a Canon 20mm 1:2.8 lens. 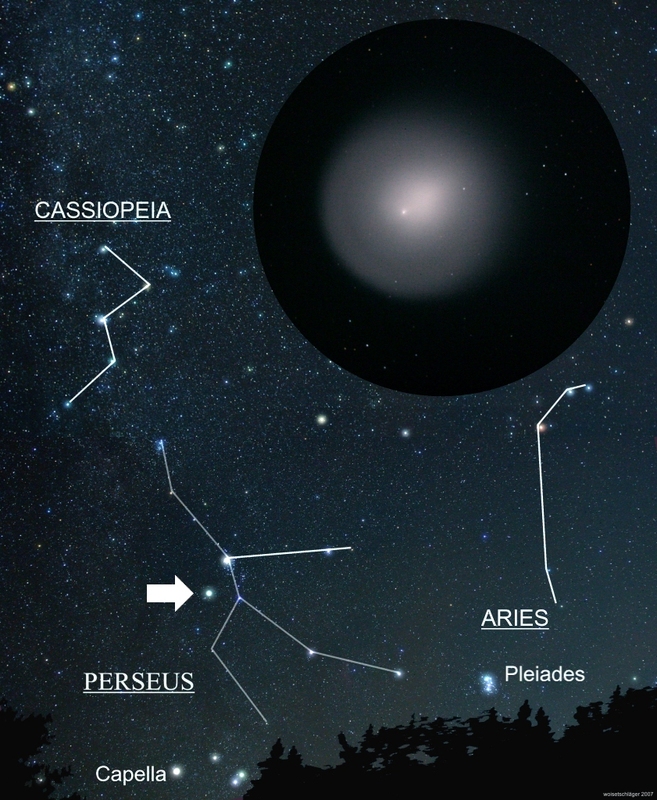 The photograph in the upper right I took through my MEADE LX200GPS 10". 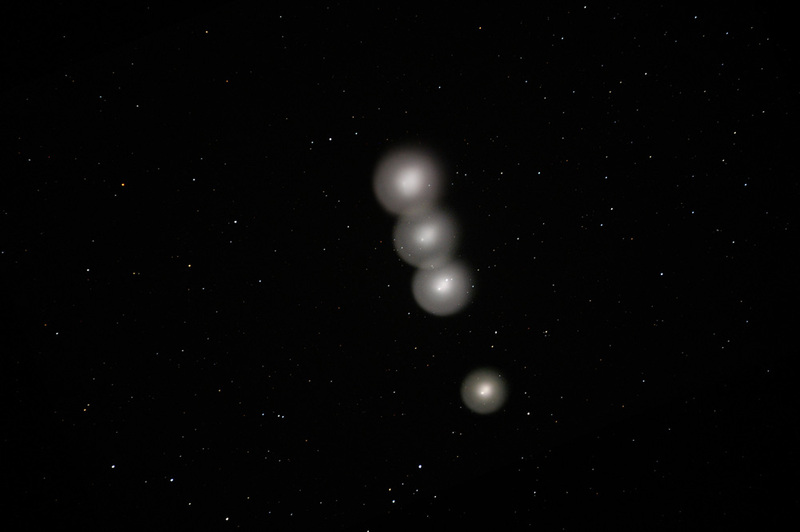 The Canon 300D was in the focal plane with 20 sec exposure time at ASA 800. 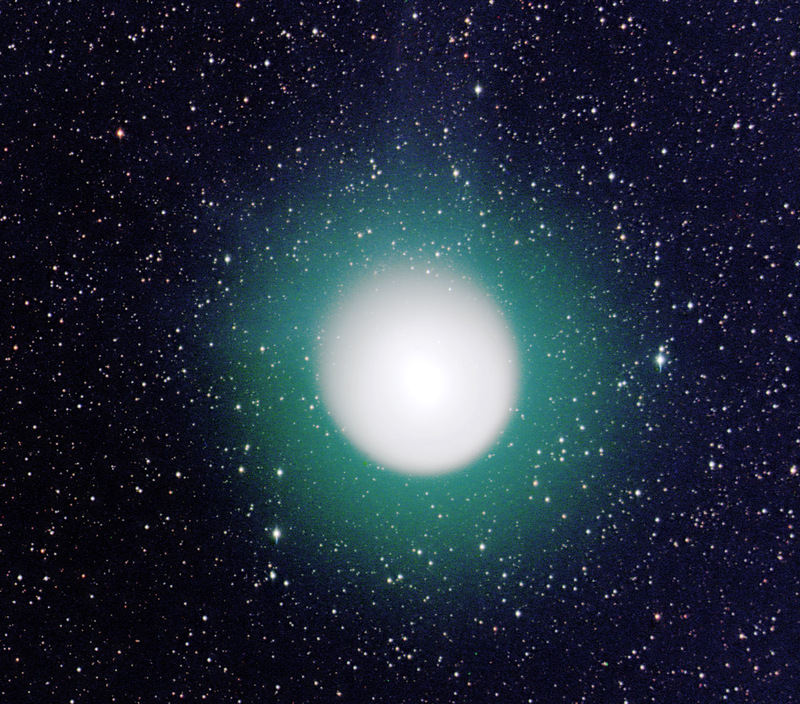 The comet tail is fan-shaped, with an aperture of about 90°. This is due to the small angle of the tail respect our line of sight (about 17°). The tail is best visible with a blue filter. The tail components are at position angles between 165° and 270°, extending from the optocenter at least 1°. The dust coma is 11' diameter and the gas coma is about 42'. Tech details: Schmidt Camera 300mm f/2.0 + CCD from a light polluted city. 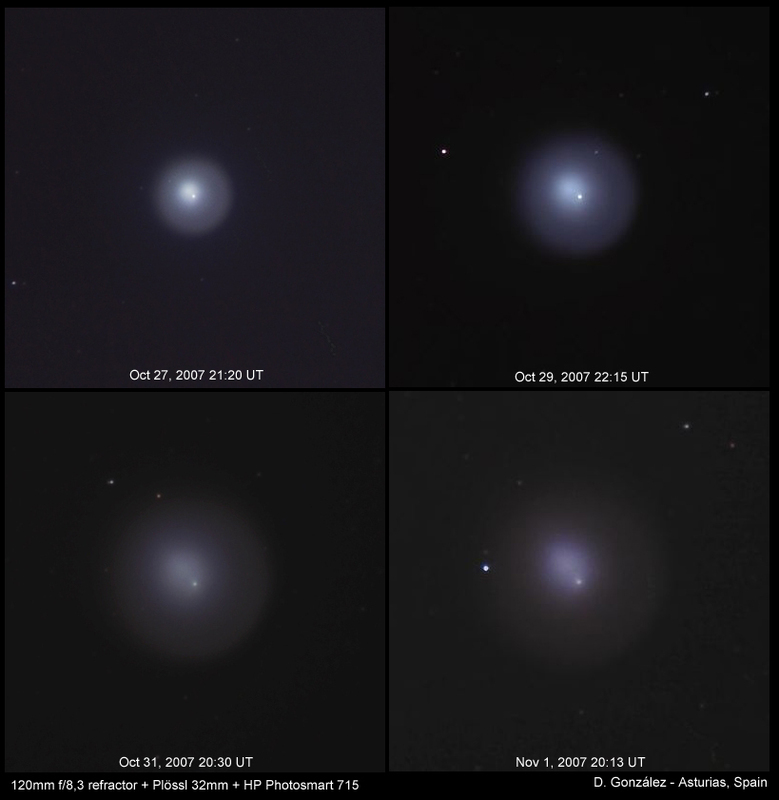 1-2 november 2007, RGB 2.46 (2 nov) - 23.21 (1 nov) - 20.34 (1 nov) UT. Total exposure 3h46m, in frames of RGB 30:60:120 s each. Central dust coma elaboration with Larson-Sekanina 10°. North is up. String of Pearls. 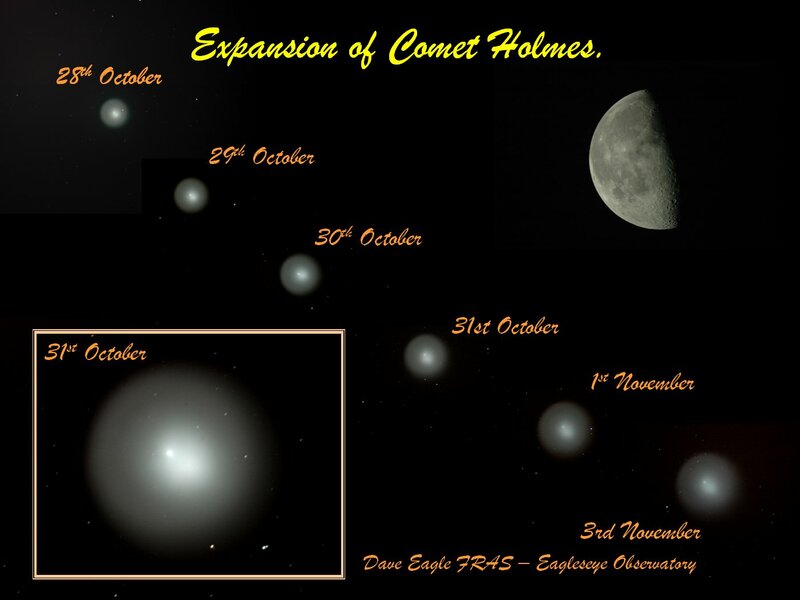 I carefully superimposed and aligned the stars in 4 photos of Comet Holmes between October 29th and November 3rd. 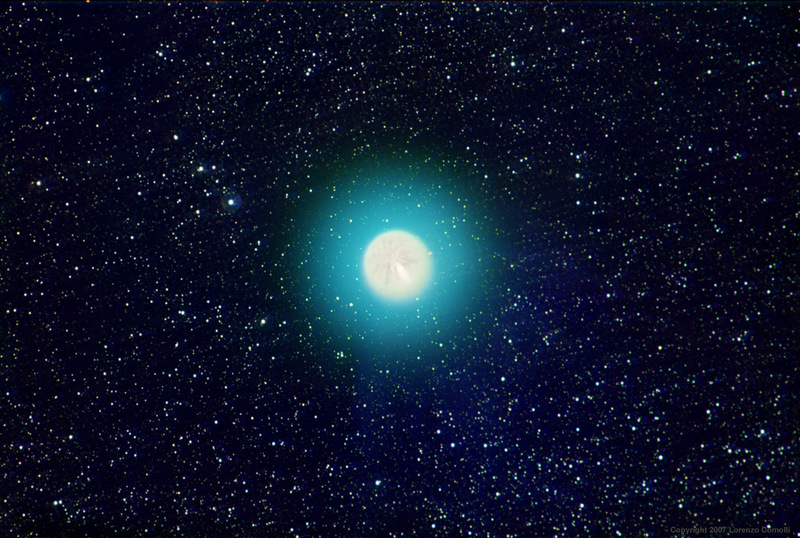 I then blended the layers into one image. 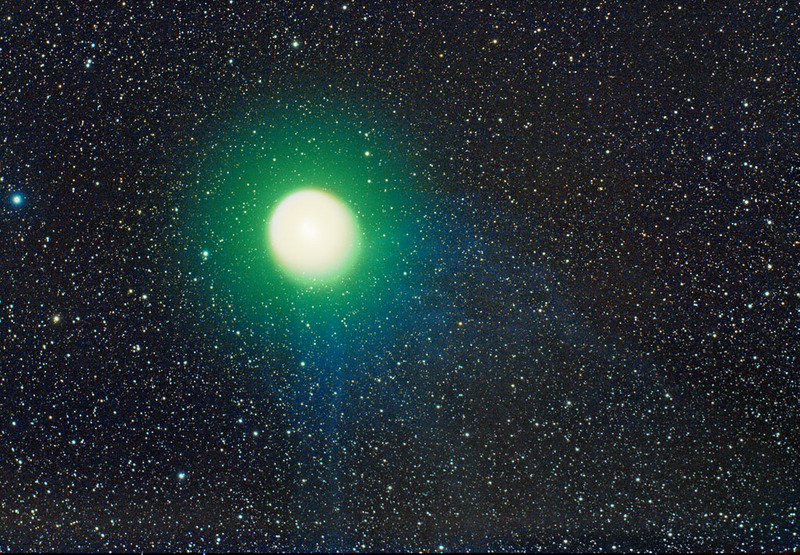 The resulting image looks like a string of pearls and show the growth of the comet. Data is missing for 2 days due to cloudy weather. 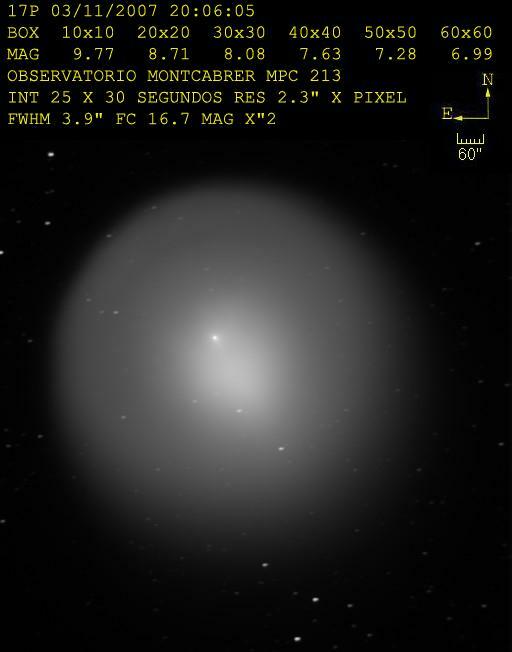 Imaged with a digital SLR and a 4" apochromatic refractor at prime focus. 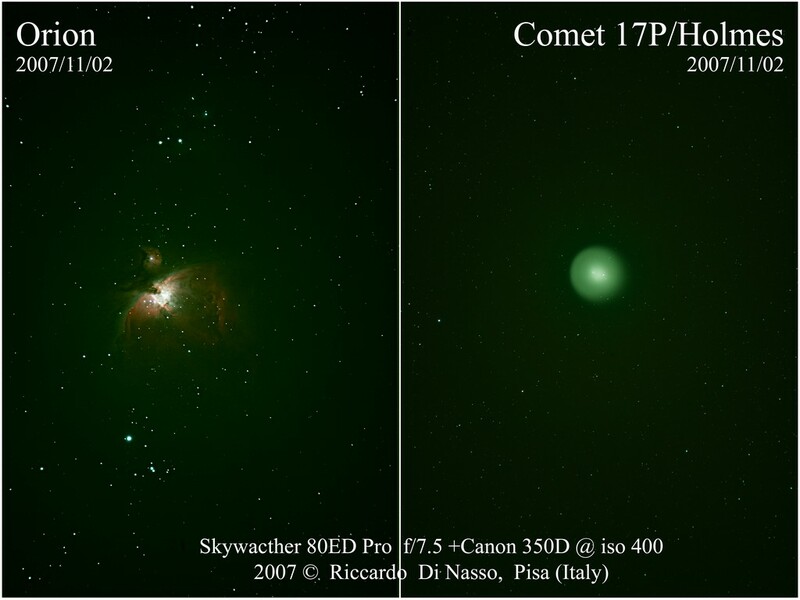 This is a confront to a new big comet holmes and the Orion, The 2 photo is a Take in the same night and same strument skywacher 80ed pro and canon 350D modificate. 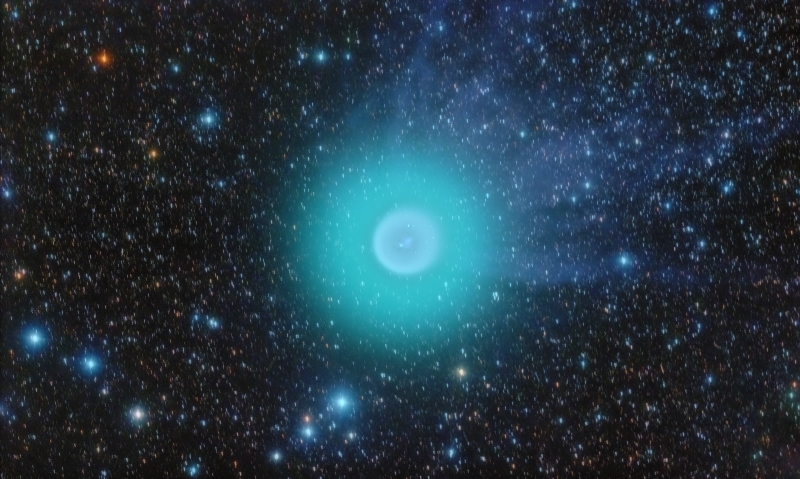 The comet it's now grat like Orion!! This is an image from Novermber 4, 2007, taken with a Canon 40D modified, using a 200mm lens @f4.5. Combinations of 30 second, two minute and 5 minute exposures from ISO 200-1600.Looks like three tails or a larger tail with streamers.